Friends, Would you come with me today? Across time and culture, beyond distraction and schedules that enslave us? I send this dramatic monologue to you today——the words I will speak this Sunday in our service. Maybe they will help us enter into that day? I was there that day. There were so many people there---- but it wasn’t that. Jerusalem, what a city it is for people and crowds!! And it wasn’t even the procession, the parade. These last two years-----there have been so many parades, trails of stumbling, lisping, broken, drooling people rolled, pushed, carried, slung hoisted to him. Yeshua. No one would dare to believe in healing----except it was happening. To EVERYONE! Even the sorriest among them . .. .
Everyone became like----new born! Legs straightened and muscles strung right. Women who were mute----now they are singing and adding a little dance too!! And crippled men are running and leaping!! So—yes, we’ve been watching these parades for many months now. But this time--- they finally saw WHO he was! Everyone ran to pull down branches from the trees. Whih means----Victory! Triumph! When was the last time we were victors of anything? And we all took off our cloaks, our outer robes---and just laid them at his feet and at the feet of the donkey he was riding. We knew what we were doing because ------Finally we all saw it. He was the king!! He was the one we’ve been waiting for since . ….. since we were a people. And the singing! Everyone was happy! We are not ----we have not been happy people. But this day! Children singing and old men, my grandpa, the young mothers----everyone! Cheering laughing shouting! Hosanna. And you know what “Hosanna” means, yes? It means, Please Save us! Save us! How did this happen?? From O Save Us Our King, Our King! But maybe I know. They wanted a king, a MAN king who acted like a god. They didn’t want a king who WAS God. They never really wanted God at all. I wonder how many of us want God to enter our world and become king over our lives? We think, foolishly, that we will give up too much. But here is what I know now: that day of singing and celebration and triumph was true. "Ho-sanna!! Praise to the King! O Save us!!" we shouted. We began to talk. We opened our lives. Finally she said, "If you asked me the one thing I need most in my life right now, it's to learn how to tell my story. I've been through some horrific things. Everyone who hears my story tells me to write it, but I don't know how. I can't believe God sat me next to you." Many of us come from the Land of Secrets, where everything must be buried and hid away. The buriers think they are staying alive, not knowing how much has already died in the dark. Stop saving your life. Spend it. Tell it. Write it. Be generous, profligate with it bcz your life is not yours to keep, horde or hide. Everything that has come to you: the ugly, the lovely, the break-ups and tear-downs, the crushes and crashes, the grieving and groaning, the riddles and the cancers and healings----however secret they have come, under whatever beds and closets they hide---they do not come for you alone. Bring them out to life and light. And send them on. Comfort others, pass on whatever you have seen and heard for their sake as well as yours. Weep with those who weep. Rejoice with those who rejoice. Tell your story because not a moment is wasted in God’s economy, not the fall of chickadee from your tree or the wandering of a rebellious sheep or the fall of a strand of you hair goes unnoticed by God and we should notice too. Who else knows as you do how it felt to hold your mother’s hand after her fall, and how you had to argue her onto the gurney, all the while knowing she doesn’t even like you, that you are not one of her favorite children but you do it anyway because you still love her? Remember first time you ever danced with your son——at his wedding? And remember the time you climbed that mountain near sunset and an eagle sat in a tree in silhouette and your son lost his shoe over the cliff and you ended up piggybacking him down the rest of the trail while you both sang “Deep and Wide”? Who else knows how that feels? Oh the things you have done and seen in this life!! Don’t hoard it. Don’t stash it in some cache to keep it from those who need these stories the most. And those who watch and listen and write and speak, those who are looking for God in every minute of their life------will find him. But don’t write or speak your stories to gain love or acceptance. Because when you write the very best you can, which means that you tell the truth and you tell it straight and kind, and that you do not write to exact revenge, only to scatter grace and light in graves and closets---some will dislike you. Some will reject you. Some will think you’re an egomaniac for daring to put marks on a page from your own life. Some may call you a liar and a thief. It happens to writers and truth-telling speakers all the time. But it’s okay, because you are honoring the life God has given you. Why am I telling you this? I have seen so much lost. When you seal your lips and your memories, you will lose not just pieces of the past and pieces of yourself, which is tragic enough, but you will lose seeing God Himself. Jesus would not waste the crumbs after 10,000 people ate, and I don’t want you to lose an entire basket, even a single crumb. If you stay silent, someone will not be fed, and the first someone is you. The rest is all of us. In the end, writing and sharing our stories is not about my father or the little children running away or the mother carrying her son down the mountain----it is that in all of those moments God is present in ways we are blind to, and we have a chance to live those moments again, this time wide awake. Dear Friends: Don’t hide your life underground. Spend it! Tell and live a better story, a richer story, a truer story. It can raise the dead to life. Friends, There are SO many other reasons to find and share our stories with one another. Anyone have another reason? Or—-something wonderful that happened when you shared your story with someone else? All this week I have been crossing borders. So many. The hardest border was across an airplane seat-----but the longest border was in Tijuana. It was just Duncan and I, the two of us on spring break together (Really? Like real grownups?) Driving into Mexico at the San Ysidro border, through San Diego, wasn't even a blink. No stop. We had our passports in hand and no one was there to stop us anywhere. We were in the U.S. one moment, then driving along the border wall the next and there we were. Coming back wasn't so easy. It took three and a half hours of idling, in a snaking line, waving off gentle peddlers with serapes, aprons and churros at our windows. Waiting for border guards to pull off panels from a truck in front of us. "Is it this busy because of Spring break"? my husband asked a border patrol guard along the way who looked friendly. "It's always like this," he said. 'It's the busiest land port of entry in the world." Later I look it up. 70,000 northbound cars and 20,000 pedestrians cross every day. I’ve crossed borders in more countries than I have counted, and never like this. But the hardest border crossing was the closest. I was in the dreaded middle seat on a flight from Seattle to California. A small woman with a cane sat against the window. I buried my head in my computer, for so many reasons. It's exhausting talking to a stranger two inches away. And always the book deadlines. But somewhere over Oregon I spoke. I don't remember what I said, but we ended up talking for over an hour. *Sally was a recovering alcoholic and meth addict. "I've been clean for four years," she said smiling. Her face showed the wear. "Congratulations!" I cannot imagine the difficulty of this. And I find out that Sally has MS, diagnosed 15 years ago. And there is more. She is recovering from brain surgery. We talk about her disease, her surgery, our children, her father. We talk about God. Sally lights up. "That's why I'm alive. I wouldn't be here today without God. He's saved me so many times. The aneurysm should have killed me." At some point, she takes my hand and guides it to the back of her head. "Do you feel that lump? That's from the surgery." I cringe with her hand on mine, then my hand behind her head feeling the lump. This is a border I didn't want to cross. Ever. But here I am. Near the end of the flight, when she finds out I'm a writer, Sally tells me, "You can tell my story. I want people to know how good God has been to me." A few days later I am in line at a Starbucks. A young latino man skips in line behind me. He speaks to me almost without taking a breath. "Hi, oh it's a beautiful day, and I'm so happy to be alive, aren't you? I mean look at this, we're all here, alive in this place," and he gestures to the 30 or so people with coffee in hand, poring over phones and books. "Yes, I'm happy to be alive too," I smile back. I too have felt this, suddenly looking around wondering if anyone notices that we're all breathing and having these moments together in this place. "My name is Angel and I want to be an angel. What if everyone here was an angel?" And off we go into a weird labrynth of conversation I cannot begin to recall. The line is long and we talk a long time. I think Angel is manic or high right now, but God is here anyway. We talk of heaven. How we should be grateful for every moment of life. Now he is telling me his favorite book of the Bible and I'm saying mine when a grizzled man in a yellow t-shirt and red hat passes us. "I read my Bible every morning. You gotta read your Bible," he admonishes us as he passes holding a bag he pulled from the trash. Behind us stands a 6'5" African-American man in a tight beige miniskirt and a long red wig. He smiles at me as I turn. I smile back. I would love to talk with him, to hear his story. I order my coffee and pay with a gift card and wait. Behind me, Angel orders. "Just water please." I'm about to walk away and I can't. Someone gave me the coffee card I'm using. I know it's not just for me. "Angel, order a coffee, whatever you like." "Really? Are you sure?" After, with his iced coffee in hand he asks, "Why did you do that?" Some flights and some days I'm cranky. Sometimes I build a Trump-sized wall around myself. Sometimes I need to. But when I pull the wall down, one small word at a time, I have found people who need to be seen and heard. Who maybe need a coffee and even a hand behind their head to feel the lump. And in those minutes, whether we find our way to God or not, I am (mostly) happy. Because Angel is right. Here we are all alive together and breathing together, all of us created in the image of an incredible God and maybe if we cross the borders past our own thick skin, we can bless one another? I need it as much as they do. Many in our country want to build more border walls. I want to tear mine down. Dear Friends——Have you torn down a piece of a wall lately? Would you bless us all and tell us about it? 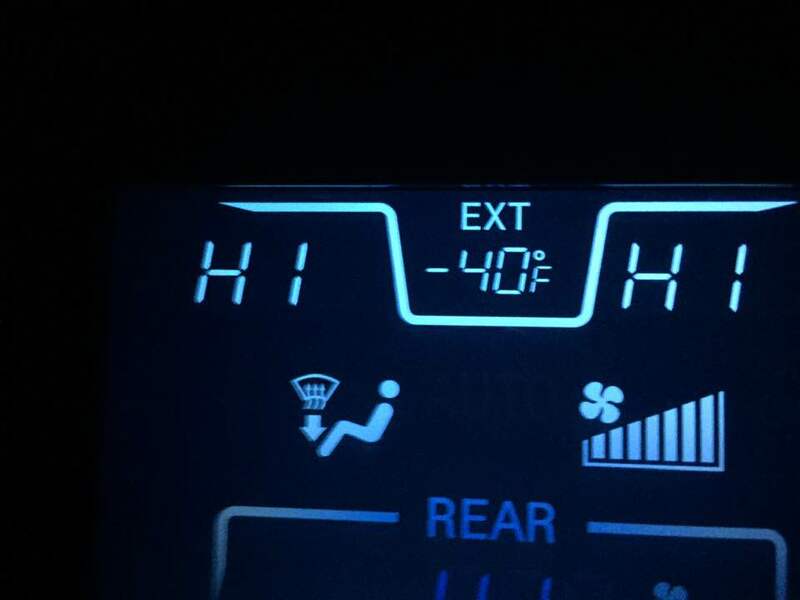 HORTON, ND—It was time to eat dinner at the Kendall household and Gregory Kendall, who had just come home from a long day selling auto parts, was in no mood to pray. Finally, the Kendalls’ Amazon Echo device offered to lead the prayer after the always-listening device determined the awkward silence was probably never going to end until someone stepped up to bless the food. (See how Her secular prayer ends! HOLLYWOOD, CA—A new filtering service aims to make films more acceptable to a Christian audience by replacing every actor with Kirk Cameron. KirkView, an upstart tech company founded "by Christians, for Christians," is trying to help believers watch filthy movies by digitally imposing Cameron over all the actors in the film. Previous streaming services have replaced cuss words and suggestive scenes, but now Christians can watch movies the way God intended: by only seeing Kirk Cameron in every role. Kirk Cameron’s face does NOT appear, however, in our local production of NEWSIES! The hit Broadway musical is on our main stage this week and next—-and my two youngest sons are in it. Pure joy. Pure laughter. I want to fix our nation. I want God to fix the world. I want clear answers and immediate solutions. But when those don’t come, we can laugh. We really can. We can laugh because God laughs. Why the big noise, nations? Why the mean plots, peoples? “Let’s get free of God! Heaven-throned God breaks out laughing. We can laugh and “shout to God with cries of joy.” And there’s a reason we can do this: ”For the Lord Most High is awesome, the great King over all the earth.” (Ps. 47) Nothing and no one will alter His purposes and plans. What kind of God does this? What kind of God inspires writers to pour out their doubting hearts to Him? A God who knows the end from the beginning. A God who says, even when we mourn, we are blessed, for our mourning will be turned to laughter. A God who knows that daring to doubt is better than pretending to believe. Dear Friends, May we laugh or lament with you? What are you lamenting this week? What has made you laugh this week? 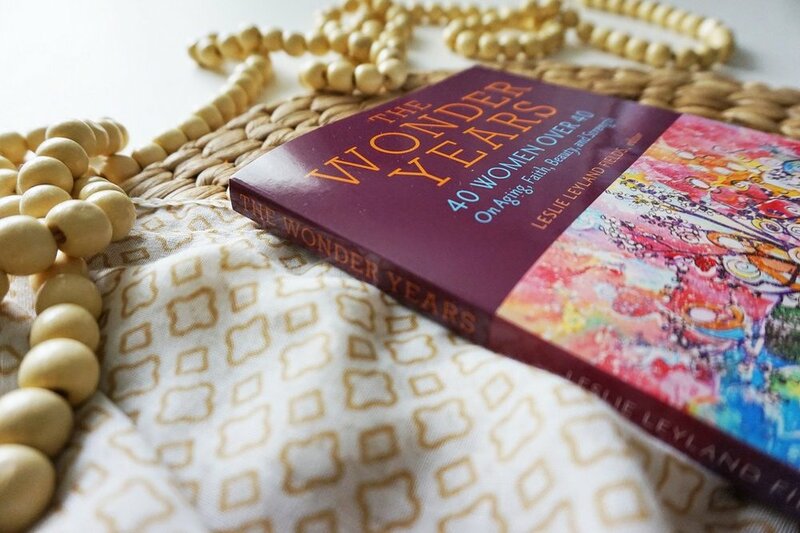 AND——I’m giving away 5 Wonder Years books this week in honor of International Women’s Day. Leave a comment below with your EMAIL address, and I’ll do a drawing. I hope you win one!! Flying home from Texas——-I never tire of this land and sea and ice scape. And then flying to Kodiak . . . I brought back with me hugs, words, stories, so much shared with the women and men of Faith Family Church in Texas. There is nothing like Southern Hospitality! They really know how to do it!! Here are a few of the beautiful women I got to share the weekend with. AND—the fearless and tireless Miss Tamara, the vision-er and force behind the ANCHORED conference. My cup was emptied out—-and filled again with love. But how do we live a life of love in this Age of Outrage? Even the most peaceful people-pleasers among us pick up a few haters along our way. Especially online readers, followers and “friends.” What do we do? 3. Love them (and love yourself) by sometimes staying silent, no matter how outrageous the accusations against you. Don't feed their dis-ease by responding. Most of the time, they cannot hear you and they are not interested in your experience of those events. Some of these are dear people with mental and physical health issues and trauma in their own lives. If you respond, you’ll likely prolong your pain and theirs. 4. Love them by listening between the lines for the real issue, the deep hurt that they're speaking and acting from. If the Holy Spirit prompts, respond kindly and with concern, not to the issue at hand, but to their own experience and well-being. “I’m sorry you’re struggling with difficult feelings right now. Is there some way I can help you?” They’re expecting a fist fight. Give them a hand on the shoulder instead. 5. If this person has contacted you on social media, Love them by calmly and respectfully inviting further dialogue with them through email rather than a public site. But only if prompted by the Holy Spirit, only if you believe further communication can help THEM (not you) and only out of concern for them rather than for a righting of your own reputation. 7. Love them by praying for them. Yes, really. Their inappropriate response makes it clear that they are likely more hurt and damaged than you are. You’ve been given the Holy Spirit. You’ve been given all you need to do this. They likely have few resources, while you have many. The whole world is gasping for grace and love. Who needs it more than anyone? Yes. The haters. As the Lord has flung his profligate mercies upon us, let us do the same for them. Friends, would you share a time when anger or enmity was met with grace? These real stories SO encourage us all! This week I am in Texas, speaking at a large church in Victoria. So glad and grateful to pour out the words God has given. And going, always, in weakness rather than strength. Last week, my husband and I escaped town and our relentless schedules and the flood of bad news on our screen. 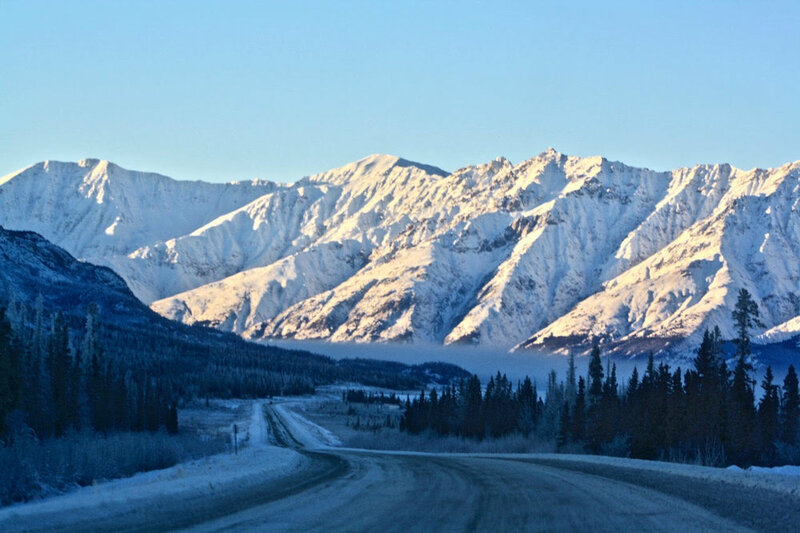 The national news is so constantly jarring, and now this week, Alaska’s news is just as bad. We didn’t go far——just an hour “out the road,” the one road out of town that winds for 60 miles into breathtaking country. We were lucky. It was foggy, making our disappearance complete. No one knew we were there. It felt like we were a million miles away. What were we escaping? What is “Alaska’s Disaster?” This is not my space to talk about politics, but I’ll give it quick nod. (Fellow Alaskans who disagree, let’s agree on grace toward one another, even if we have different views?) Our new governor got elected by promising every Alaskan a check for $3,000 in their mailbox, their full Permanent Fund dividend. (this is complicated and I won’t explain it here.) He did not, however, while running, ever give us his plan to balance Alaska’s budget, which has been in trouble for some time. Now he’s threatening a 40% budget cut. What gets cut? Education. Headstart and preschool programs. Forty-one percent of the state university budget. Medicare and Medicaid. Farmers. The state ferry system—-which Kodiak and every coastal community depends on. And so much more. They want it all gone. As if there is no other way . .. So we get in our car and go. We go for a walk along the rime-edged shores of Lake Rose Tead, surely one of the most beautiful lakes in Alaska. There are bald eagles here in scores. 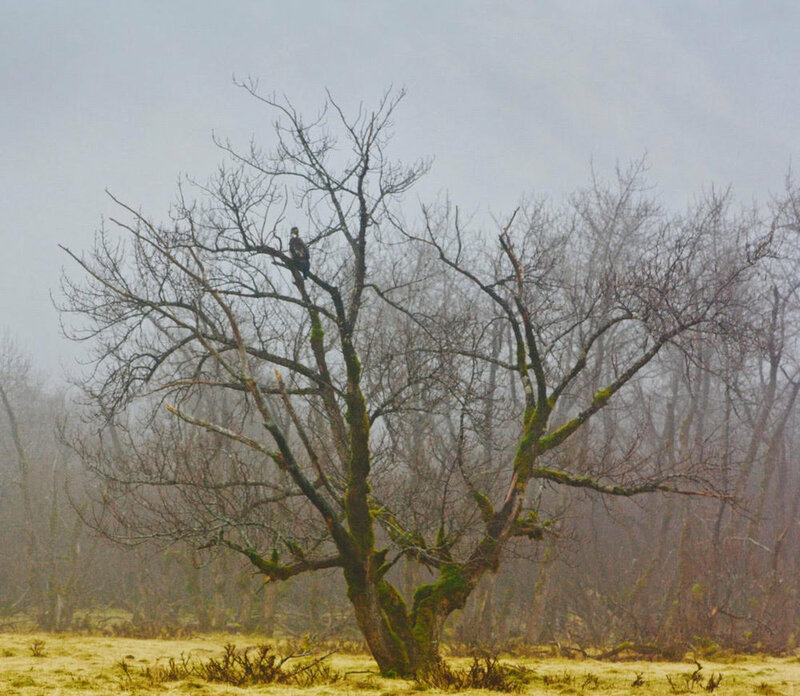 One immature eagle let me walk to the base of her misty tree before she lifted off. Glory! And the tundra swans are there. They’re new in the neighborhood. They’ve come down from the north, discovering our Kodiak rainforest, our waters thick with food. Our temperate climate. Sometimes we drive out to and there’s not a swan to be seen. Today, there were 100. We counted. And a funny thing happened. The first flock of swans saw were such wild creatures. So skittish. I snuck and slid and hid among the alders, camera around my neck, wanting just a peek. Just a shuttered moment to catch them. And I did. Four sailing swans stayed long enough to let my lens watch them run, rise, and arrow straight into the foggy skies. But the rest of them? The 96 others? I slipped surreptitiously along the edge, noiseless, hunched low . . .. and there they were. I crept closer, expecting them to startle and flee, as the others did. Then closer. They did not attend to me at all. Then I stood at water’s edge, a stone’s throw away and they regarded me not at all. I called to them. They just kept pluming and swanning as if I was not there. For ten minutes I stood there, close, feasting on their wildness wondering why they would not flee from me . . ..
And then this poem by Mary Oliver, which maybe tells me why. I do belong. Even in the wildest of places. 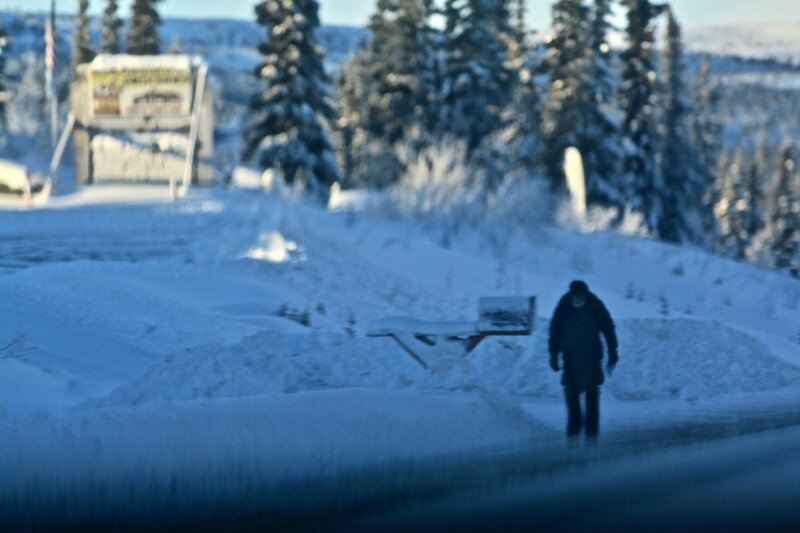 Even in whatever protest I join, to protect Alaska’s elderly, the needy, our kids. The world and the Spirit of God calls to us all. This is our family too. Love's Record of Wrongs & How Do We Keep Loving? #3. Kitchen crimes! Here, notice the position of the silverware? Who Will Save Us From the Kitchen Wars? a kind of sauna, is where and how we bathe in the summer. But the year we moved to this uninhabited island to build a house, we didn’t have time to build a house AND a banya AND an outhouse. So---someone in the marriage proposed a temporary solution: Ta daaa!!! A Two-Fer: To combine the outhouse and the sauna in one tiny building. Yes, flies and smell and all. I laugh now (after the eyerolls) when I think of hauling all my babies and children out there to get clean, while swatting away the outhouse flies . .. And don’t worry---it was only for 12 summers. So, how DO we keep loving one another? How DO we keep forgiving one another? We all bear 1000 wounds. All of us. But don't take them back, though sometimes I want to. Sometimes I want to erase whole years. But I can't---and I won't even try. Who are we without those wounds, the places we've been, even the ways we've hurt each other? When we "remember well," we will find the presence of God even in the outhouse/banya, and especially in the dark and stormy places. Even in memory, we can find Him there shepherding us toward a better love, a love that can finally disarm the haunting and the hurt of what others have done to us. Why, my friends, would we choose an emptied past over a healed, reclaimed one? Because we know, even with our mouths stuffed full of chocolate on Valentine's Day, that it is not pain itself that diminishes us; it is our response to it that determines the kind of lives we will live, the kind of people we will be, the kind of loves we will possess and give away. How do we love each other? Let us count the ways. Tell us, bless us with one way you have "remembered well"---or loved well this week??!! This week I saw and heard the collective cheers, the triumphant shout in the house, the pink lighting on the One World Trade Center, the smiles as Gov. Cuomo signed the new bill. Wow. Maybe you were cheering for women like me, who found themselves in an unplanned pregnancy at the wrong time of life. Maybe you are imagining how much suffering you can alleviate. Maybe you are thinking this is the ultimate empowerment for women: to free them from the physical and psychological strain of birthing and raising a child. I know you're proud of this hard-won victory, that now women in New York can end the life of their child at any point in his or her formation for the sake of their own health. That we no longer have to even use the word "abortion," but rather we can speak of it all as "reproductive health choices." I don't want to argue about the child, the human being in question here. I'd like to think for a moment about your main concern: the health, well-being and empowerment of women, because I believe in this as well. I’m going to say this straight: I believe you think too little of us women. Are we so weak we cannot bear and birth a child, even in difficult circumstances? When I wrote Surprise Child: Finding Hope in Unexpected Pregnancy I interviewed 100 women from all kinds of backgrounds during and after their unplanned pregnancies. Every woman pressed on past her fears and concerns. Even when they despaired, they did not end their baby's life to end their own anxieties. Through the crisis, they emerged richer, deeper, wiser, more loving. Ask any woman how she feels about her child on the other side of a difficult pregnancy, and she'll tell you: "I can't imagine life without her." Don't exploit women at their weakest. Believe in their strength. I saw a lot of men in that cheering company. In fact, the New York politicians and lawmakers are mostly men. Perhaps this is an even greater victory for men than for women? No child support payments, no fatherhood responsibilities, which go on for decades. Many women I talked to felt great pressure from their boyfriends, even their husbands to abort their baby. A few did. Is this more about men's empowerment and freedom than women's? I know you are a supporter of women's rights, and as such I believe you also have a firm conviction against racism. This is a great time in our country, seeing so many working together to eliminate race-based injustices and violence. It's troubling, then, to discover that in New York more African-American babies are aborted than born. I am concerned for that community and all they are losing. Maybe you are as well. Maybe your focus is larger, more environmental. Perhaps you are worried about overpopulation, about depleting our resources. Our annual population growth rate right now is .7%, less than 1 percent. (In 2016, there were just 62 live births per 1,000 women of childbearing age, an historic low.) Immigration is down as well. In terms of population density, out of 215 nations, the U.S. is 177th in population density. Demographers and economists are deeply worried: Who will fill our jobs, pay taxes, keep our economy viable? But maybe it's all about women after all. I have no doubt that you would have looked on me with compassion 17 and 19 years ago, when I had a house full of four children already and then found myself in two unplanned pregnancies. You would have wanted to liberate me, to help me act on my fears and insecurities: how could I possibly love and provide for another, then another? How could I birth a baby safely at the ages of 43 then 45? What would happen to my teaching and writing career? My husband is a fisherman and travels much of the time--how could I raise six kids on my own half the time? 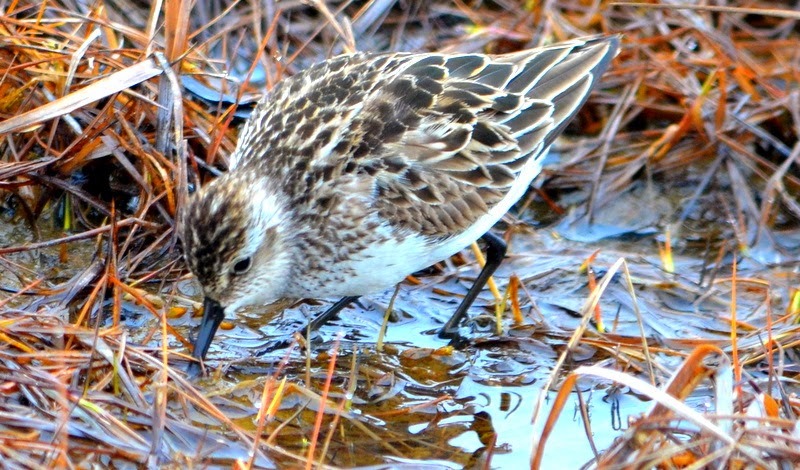 How can I deal with two more babies out on our Alaskan wilderness island every summer, without toilets or showers? And I would be raising kids into my mid-60's. How could I possibly persevere? I confess to you that I thought about abortion. If you had escorted me to the doctor at any point, he or she could have easily signed off on my poor health. (The New York law doesn't define what they mean by the mother's "health," but in a companion case, Doe v. Bolton, the U.S. Supreme court defined the mother's "health" as a composite of "physical, emotional, psychological, familial, and the woman’s age" . . . ) I'm glad you weren't there to bring me, at my weakest point, to that doctor for my "reproductive health options." I'm 61 now. I teach writing workshops around the country. I travel and speak around the world. I'm signing a contract for my twelfth book next week. But none of this is nearly as important as my kids. My two unplanned pregnancies, Abraham and Micah, are now 16 and 18. They’ve enriched my life beyond any system of accounting. They are the bright lights of our entire family. They are creative, generous, kind, smart, hopeful. They are as beautiful and talented as all the other children whose lives have been taken. Let our children live. Let their mothers grow fierce and strong. Let fathers know their children. Let our country protect all its people again. My two surprises, who surprise me still, every day. If this resonates, would you consider sharing? (Facebook is not allowing me to boost this piece.) thank you! The beauty of this earth reminds me what is real. And what to properly dread and fear. It is not weakness to fear. We are human, not gods so it is right for us to fear. There are thousands of fears to choose from. And If you do not choose them, they will choose you. So let us choose our fears well. that gathers all its muscle into stone walls and safety, refusing to see, to hear, to enter into other’s rejoicing and sorrows, a heart that gains sad strength through dispassion, protection through disaffection, contentment through ignorance. especially the kind that seeps in under your skin and twists your words, clouding your eyes, making all people look alike, turning your hungry neighbor into a far-away stranger, turning the far-away stranger into a faceless apparition, turning every politician into a demon, and everyone who disagrees with you into an enemy. the sly insistence on "quality," our slavery to the choicest foods, the softest beds, the shortest trails, the plushest cars, the happiest feelings, the brightest churches, the best retirement, the easiest death. when it preaches a loyalty to the “true self” above loyalty to any other, and when it finds that self more lovely than any other. those clever routes to excuses, that all is hopeless, nothing can be done, we can’t help anyway, God is sovereign, the world is soon to end, ignore the human crises, the toxic health of the planet; camp out like Jonah over the world and wait, with gloomy hands folded, for the inevitable (whew!) fiery end. ﻿Yes. fear this. and its prophets and evangelists who offer national salvation through their political party; who threaten national damnation through the other party; who teach us we love God best by serving our country first. Who blind us to the only kingdom we are called to give our lives to. who wants us to believe this life is all there is, so don’t withhold whatever we need to make our short passage safer, happier, more exciting, more successful, more enriching and, above all, more American, meaning, more individually free, prosperous and authentic, no matter what it costs. which is to say, LOVE the Maker of our body-and-Soul. our Breath, our Light, our Bread, our Blood, our Hope. Our Lord. Friends, we’re okay. We’re going to make it through the elections. The sun did not rise until 10:30 and it set by 3:00. Yet such beauty in those few hours! It is magical country, this, and I am glad to see it in the winter. I have been as breathless as the air is still. And such silence. We have been nearly alone in it. All day today we passed maybe 10 cars. But we have not been alone. I must tell you about a little miracle that happened along the way. Duncan and I come over and stand beside him, peering. 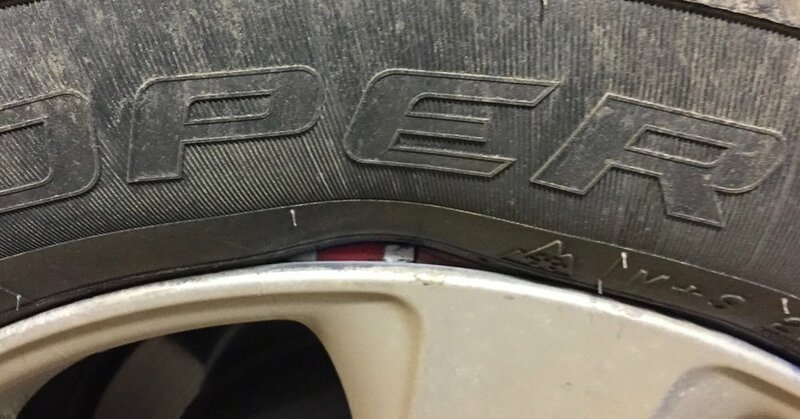 I could hardly see it, but there was indeed something red, jammed between the tire and the rim. What on earth? We gaped for a moment, puzzled, then he said, “I’d get that checked if I were you. There’s a tire shop right over there” and he pointed. What if the tire shop wasn’t open? What if we had to wait for hours? It would be dark soon and we’d miss covering all those miles. We had to try. The shop was open. And——-they had room for us just at that moment. They gestured us on through the sliding door into their warm bay. The young man popped our tire off effortlessly and came back with a sideways smile holding out something in his hand. A pen. And it was no mystery where it came from. The guy at the Tire-Rama in Spokane who mounted our new tires wasn’t paying attention. A pen fell from his pocket while working. That pen lay in the bead of our front tire for 1200 miles, 1200 frozen miles over bumps, ice, sharp corners, from Spokane, Washington to Fort Nelson, British Columbia. I know what could have happened. What maybe should have happened with a pen in our tire. The tire should have leaked. It might have blown out anywhere along those miles. Two days ago we passed a car beside the highway. On it’s side, half-crushed with the roof off. They had to cut off the roof to extricate the people. Every day as we have been driving, we are reading to one another. We’re both doing the One Year Bible this year, so we’re reading in Genesis, in Matthew, in the Psalms. About the God who uttered the world into beautiful molecular existence and sighed, “Very Good” when it was done.. About the God who saves and protects. About the God who dared to enter this fractured world as an infant, come to rescue us. And while we are reading, our tires whirling on ice and snow in the frigid wilderness, somehow the compromised tire holds. Somehow the bead holds. Improbably the tire holds. Then I pull into a full service station—a place I would never have chosen—-where an attendant saw what we never would have seen. I have been rescued and delivered so many times in this lifetime, over tens of thousands of miles of travel around the world, in a tiny boat alone at sea in a winter storm, at gun point in Guatemala and everywhere in between. And so have you, no matter where you live or where you’ve traveled. And we have no idea how many more times we’ve been saved from disaster without even knowing it. Dear friend and reader, Do not doubt that your life has purpose. Do not doubt that you are alive because God desires it so. He has good work still for you to do. And He has so much of his own goodness and wonder to delight you with even on this side of heaven. Are you watching? Are you seeing? What a Very Good year lies ahead of us! Yes our cars are overloaded. Yes the roads are sometimes lonely and long. Yes, we are driving through tumultuous political times. Yes, we are all riding on compromised tires! But we’re all headed home. My daughter, my eldest and only daughter, just married an amazing man. From start to finish it was an utterly unique and worshipful wedding. Naphtali designed her own dress. Her brother Abraham composed and performed a wedding march written just for her. I (and some stalwart assistants) made the wedding dinner (yes, involving salmon!). Aaron’s family made the dessert (A Maine staple: Whoopie pies). The week of celebration was glorious in every detail. The ceremony ended with Aaron and Naphtali shedding their wedding shoes for workboots: (hers, Xtra Tuff, of course. His, Wolverines.) 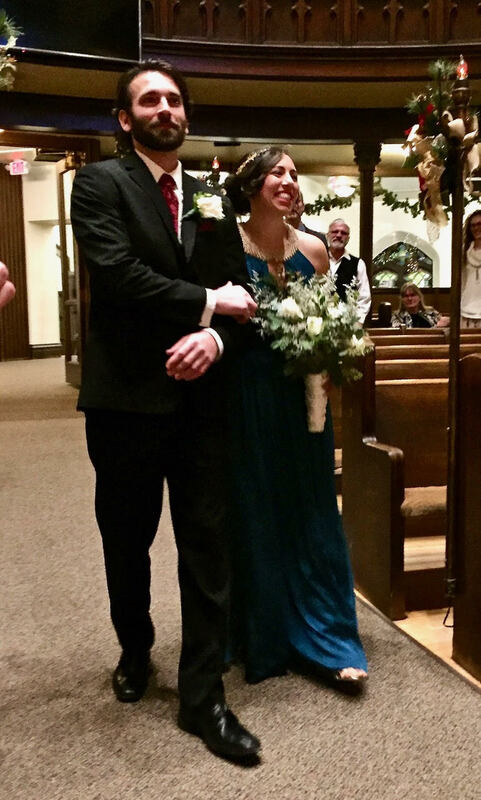 Together now, man and wife, they walked out of the church shod for the beautiful labor of building a life together. And now, the wedding is over; the new year begins, and another adventure begins for us as well: Duncan and I are driving home. 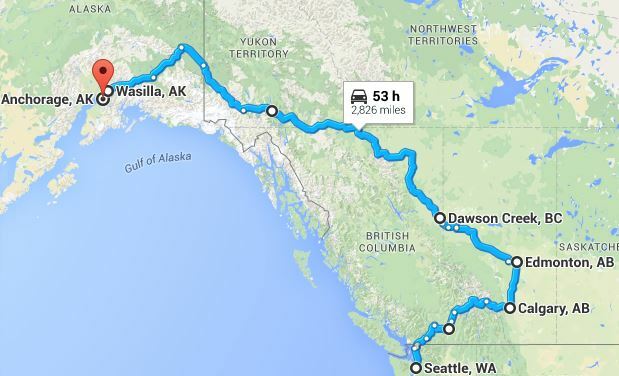 We'll start in Spokane, Washington and will take the Alcan highway to Homer, Alaska, where we'll catch the overnight ferry to Kodiak. It's somewhere between 2,600 and 3,000 miles. Not so far, but it's winter, the dead-heart of the dark of winter in the coldest of countries. Our route will look something like this. I LOVE road trips, (even after our 15,000 mile road trip last year) but this trip is mostly about need: we bought a used van in Washington (because our 22 year old van has used up it's Vehicular Resurrection Quota) and now we need to get it home. I suspect that most of you are not drooling with envy as you envision our shivering journey North. But standing in the first week of this new year, I am thinking about more than this. This odd-numbered year looms like a distant frigid country with few roads and many glaciers and threats along the way. Our car is so small, the snow is so deep, the temps are so low, the sun is so dim and the destination is so far. Will we really travel safely? Peter: “ . . . you . . .through faith are shielded by God’s power . . . But the men who wrote and believed these words about safety were chased and hunted by sword and horse. They were stoned and imprisoned, encircled by ten thousand enemies and hungry lions. Some were tortured and killed. No one in God’s Redemption Story lived a safe life. And yet every word they spoke about safety was true. They could not know about safety unless they knew about danger. When we sit huddled in our locked houses behind our gated walls, if safety is our first concern, even then we will not feel safe enough. Dear friends, our greatest need as we journey through 2019 is not to feel safe. Our greatest need is to be secure. And because my security is the explosive power and love of Jesus, that overwhelms my own weakness and fear, I can go anywhere he leads. I can do anything he asks. This is the life we’re meant for. Let’s make 2019 a year of boldness, of courage, of crossing fires, rivers and oceans in the beautiful name of Jesus. What are some ways you know God is calling you out of safety into security? What is one “river” you now God is calling you to cross in 2019? It is a December day like most December days. A month like any other month. Yet into this grey breaks a cloud hovering, a cloud glowing beneath. Hark. Halt. A piece of light, a shiver of sun glows the sky over the spruce. Maybe Christmas will come today. And it does. I found him again this morning---no, he found me. He crooked his finger and drew me close, close enough for tears close enough to steal breath. "You? You did this? You did this---for us?" But you be all we are, and all we aren't. Stop juggling atoms and oppose your thumbs. That's what we like, we like our rich to slum. Make all your thoughts as small as you can think them. Quite English. We will almost understand. There's secrecy aplenty in appearance. Face it, another word for skin is hide. Show me the face that never lied. He has shared all of these atoms from his whirling hands with us. He is altogether a bony bloody contraption as monstrous and wondrous as us . …. Oh God! That you should BE a baby. For us. To come and meet us so. And so comes the light. Light into night. Light into flesh. Light upon light. Dearest Friends, from my house, my heart to yours: May Christ be born in us today. Do you feel a bit bereft of Christmas Spirit this year? Or—-just wondering what you can give that would be meaningful? This is for you. First, a story. When I was 12 I went reluctantly to a birthday party. Karen was two years younger than me and I didn't know her that well, but there were few parties in this tiny town and there would be cake. Which meant sugar, and we didn't have much of either at my house. We sat around the kitchen table, six of us. After the birthday serenade, I ate my cake slowly, letting the frosting melt in my mouth. Karen began tearing open her presents. I stopped eating my cake. The gifts were lavish, to my eyes. Model horses, a dollhouse, toys from department stores. The kind of toys we didn't have. I wasn't jealous—-these were things for other people, not for us, but I sat in dread. And then--there it was, my present. It was a book, a fifty cent paperback I had just received from Scholastic Books. It was meant for me---a book about a horse. My family had no money for a present and I had nothing else to give her. Karen’s family wasn't rich but they owned the local store. I knew it was a pathetic present, almost an insult. But I had one more thing to give—-I had a dollar. That was all the money I had right then, one limp wrinkled dollar bill and I had no way of making more. I placed the dollar in the middle of the book. I had wrapped my entire fortune in newspaper, tied a ribbon I had found somewhere around it all and brought it to the party. Karen held the book indifferently, flipped through it, saw the dollar, "Thanks Leslie" she said perfunctorily and it was over. But I felt the heat of shame flush my face. It was the worst gift at the table, just like at every birthday party I went to. And--I had given it not out of generosity, but out of fear and embarrassment. In this season of giving. what if you have little to give? What if you're sad, dealing with the death of someone you loved? What if you have few resources to buy gifts this year? What if you're not jingly with merriment this month of wintry dark and cold? What if you don't decorate for Christmas this year at all? What if you're a tiny bit resentful for the thousand things you're supposed to carry off this holiday season for everyone else? What if some of your gifts are given out of obligation and avoidance of shame rather than love? Last night a dear friend called and asked how I was. "Kinda lousy, actually," I told her. I told her why. I told her about not sleeping, about the rain and the dark, the book, teenagers, the season. I had to say it. It costs too much to pretend. She heard me and spoke back. I was not alone. I'm not telling you to cry on every shoulder you see. I'm not telling you to wallow in self-pity. But allow yourself to speak the truth of your struggle to your nearest friends. Pema Chodron writes, "How did I get so lucky to have my heart awakened to others and their suffering?" Let trustworthy hearts be awakened. Truth in all its forms is a gift. Friendships don’t survive without it. No matter how old they are, tell your children stories of when they were young. Let them love the stranger who is their younger self and let them see your love for her too. 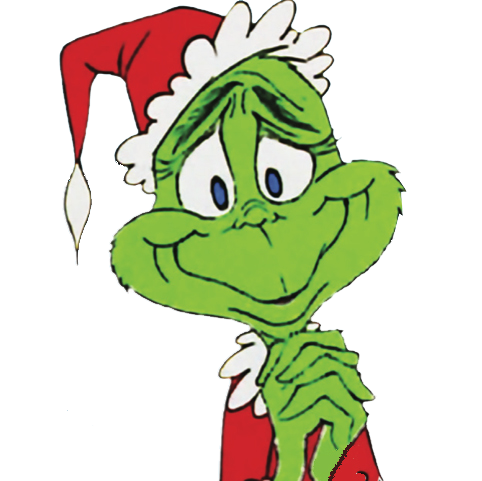 Tell your own growing-up stories---about Christmas, about school, the memories that make you laugh. Without family stories, we are exiles in the present, marooned without context, without history. Even sad stories can contain beauty and comfort. Pass it on. When there is only silence about the past, we wander, homeless searching for somewhere to belong. Giving your children a heritage is giving them a home. "You're such a good father." "You're the most caring person I know." "You're so beautiful: outside-in and everywhere." "I forgive you. Will you forgive me?" "I'm always here for you." GIVE the reason for the hope that is within you, especially if that hope is Jesus. When we do these things, we’re doing something that echoes that first Christmas: we’re giving a touch of Jesus. This year, in this space, I hope I have done this for you, friends? I have tried—-To speak the truth, the truth of my own life and struggles, and more essentially, the truths of God; to Tell Stories that help us all find home, and to speak Generous Words, to let you know you are heard and seen and loved. And, remarkably, you have done the same for me. I thank you, I thank you from a holey and grateful heart. What did I miss? What else can we give, though we are poor in purse or heart? Oh my, It was a busy week, complete with yes, all of this in one form or another. Every one of these can kill you (yes, birthday’s included!) First, the earthquake. It was 9:30 am. I was sitting on my bed writing. Somewhere between sentences——a jolt! Then a rattle and shake. In the first half second my body is all nerves and senses. Washing machine or earthquake? The second second—-Earthquake!! How long? I count . . . “three, four . . .” and then it’s over. It was a 5.7. The epicenter was very close to Kodiak but it was felt all the way to Eagle River, 300 miles away. Kodiak (and Alaska in general) knows all about earthquakes, since we sit on the Ring of Fire. We had a 7.9 last February in the Gulf of Alaska, prompting everyone in low-lying areas in Kodiak to evacuate to higher ground—at 1:30 am. Earthquakes are just a part of life here. 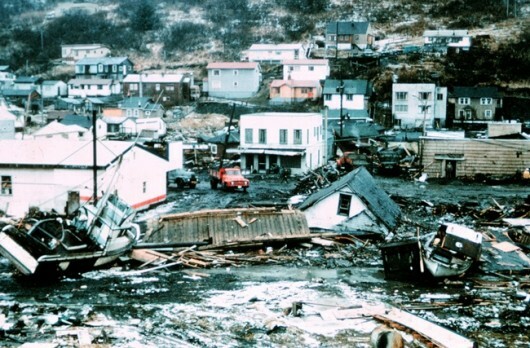 In 1964 downtown Kodiak was wiped out by a Tsunami, generated by the second largest earthquake ever recorded—-a 9.2. Volcano! This last week, while we were thawing our turkeys, one of Alaska’s eight active volcano’s erupted. Mount Veniaminof is down the Aleutian Chain. It spewed ash 15,000 feet into the air, sending a plume of ash 250 miles—-not a big eruption, but enough to say “Hey, don’t forget about me.” Alaskans roll their eyes when volcanoes erupt—-that means not only harmful ash fall, but grounded planes. Most of us have been stuck for multiple days because of eruptions. We lock our doors at night for 2-legged and 4-legged thieves. I talked to a police officer this week who said last year he went out on just a handful of calls the whole year for nuisance bears. This year they respond to multiple reports every night. The bears are refusing to hibernate it seems, especially when there’s a fresh supply of garbage offered right out on the street for them every week. (WHY and whose fault is this? I talked about this here ). The bears are everywhere around town—-near schools, stores, in people’s garages and hen houses. An elementary school went on lockdown when a wounded bear was on the loose nearby. No one walks in the dark anymore. It seems nearly everyone has had an encounter. Rubber bullets no longer work. And birthdays!! We had two this week, the day after Thanksgiving. My youngest son was born on my 45th birthday. This year Micah turned 16 and I turned 61. (Every 11 years we have an inverse birthday!) And THANK YOU to all who sent me good wishes and non-caloric photos of yummy cakes, which I was happy not to eat! I am happy to be 61. I’m excited and grateful to be 61. I am still a child. My life is just beginning, whether I live for 5 or 35 more years. I have SO much still to learn! The death I fear is not by earthquake, volcano or bear attack. The death I fear is by birthday. I don’t mean catching fire from the blaze of 90 candles aflame on the cake. I mean the slow sad sink into despond, into isolation, Into cynicism and bitterness for all the world did not deliver to my door. THIS is death: when I separate myself from the love of God and the love of others. When I forget who my Creator is and all He has done in my life. When no one is my neighbor but me. This death can pounce with razor claws at any moment. It can rattle our beds, shake down our walls, erupt in an explosion of choking ash. Or it can creep silently, one candle at a time until the house burns down. The JOY of the Lord is our strength. The MISERY of our reclusive heart is our death. 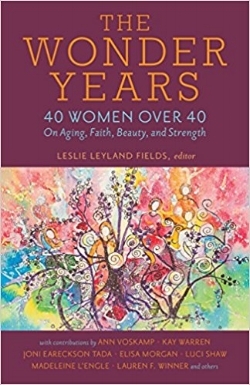 Maybe some of you need this book, The Wonder Years: 40 Women Over 40 on Aging, Faith, Beauty and Strength? It tells the truth about aging AND cheers and guides all of us onward into a richer fuller life, no matter how aflame our cake! If you’d like a copy, tell me why—-and leave your email address in the comments below. I’ll draw 3 names on next Tuesday! Happy birthday? Love to you all! I am home for Thanksgiving this year, back from a lot of wanderings. So begins my winter life (Soon this will be my view out my kitchen window). In the travels of the last two years, people have been so kind. I have feasted and been fattened. By all of this, I am flattened. This time, for once, I am not emptied and exhausted, thinned to a reed of need----but full. Overflowing. Wine running down the cut-glass sides. according to the cleanness of my hands hath he recompensed me. My Calvinism protests even stronger. No, not according to my righteousness has He rewarded me! No, not according to the cleanness of my hands. Have I really kept the ways of the Lord? I know myself too well . ... . No, it is nothing but mercy, nothing but astonishing mercy that He attends to me, rescues me, drenches me. And here I would rest---savoring and greedily gulping, swallow by swallow, all I had been given. Then the phone rings. Then the email. Another email. Another phone call. The cup tips. Wine spills. Prayers fall out, for healing, for a friend's daughter in the hospital, for a struggling son, for the victims of the fires, for a friend pouring out Jesus in a hard, far-away place. Cookies are made. A package mailed. Tears spent. My heart bent with the hurts of others. The freed man standing before the King who would not free others? The blessed man kneeling before the King who would not bless others? The glutton given a feast with the King will not share with starving others? This will not be us. I don’t want to talk about Kodiak yet, where it’s raining and blowing, and where we barreled in for a rocky landing in the midst of a storm a few days ago. My body is still in Mongolia. Today we’re all about superlatives and world records. So—-here it is. The biggest boot in the world! You’d better sit down for this . ..
Of course it’s a Mongolian boot. You’ll find it housed beneath the biggest equestrian statue in the world featuring the national hero Genghis Khan, who conquered and ruled over the second largest empire in the world, EVERYTHING about this monument is gaspingly massive and impressive, including the horizon-stretching steppes the Khan presides over. THEN—-there is the Gandan monastery in Ulaanbataar, housing an 82 foot gold-covered statue of “The lord who watches in every direction” (Megjid-Janraiseg). It took five years to build. It weighs more than 20 tons, is covered with brocade embroidered with gold, and with more than 220 pounds of silk. The statue contains 2286 precious stones, 27 tons of medicinal plants, 334 sutras and 2 millions mantras. People come, bow, give money, spin the prayer drums, touching every one of the hundreds of barrels, each one rolled tight with scrolls of holy writings . . . The writings are written and chanted in a language the listeners and drum rollers cannot understand—-Tibetan. So You don’t have to pray. You just spin the drums. But people come anyway. They come and bow and pray and listen and give money—-because they have so much hope. So much need. Everything in Mongolia feels massive. Singular. Special. Record-breaking. And heart-breaking, too. This most of all——-this longing to be known, to be seen, to be heard . . .. This is why so many there are finding Jesus, this personal God who wants to speak to them, who wants to hear from them. A God who forbids statues of Himself because he is living, not dead. He inhabits not idle idols, but the living hearts of his people. This God comes that close. But I am not in Mongolia anymore. I am home now, cooking salmon dinners, cleaning toilets, herding skittering dust-bunnies off the floors, trying work and write. It’s a let-down, you know? Back to the same old ordinary life. And that let-down can feel as overwhelming and huge as the statue of Genghis Khan, (without the metallic shimmer). So here’s what I know about the Let-Down of Missions: If we can go out into all the world in Jesus’ name, then we surely we can come home in Jesus’ name, too. That’s what I’m trying to do. To inhabit this family, this house, my church and my town with the same fierce sweet intentions of Love as I left it. This post is part of that intention. To make sure you know that your work and my work in our everyday houses is beautiful and good and brave as well. And as full of Jesus as a yurt-church filled with raised hands singing. I’m right there with you, one hand on the broom, the other raised, singing. And YOU ARE INVITED THREE TIMES! There are some pretty great ways coming up for us to meet and eat and sing and sweep the floor together! I’ve got a brand-new 4 day writing retreat happening in February in PALM SPRINGS (think—-desert beautiful sun in the middle of winter!). We’ll be an intimate group of 15 meeting in a lovely house on a golf course under the San Jacinto mountains. I’d love to see some of you there—from very beginning writers to advanced writers. (I’ll give a discount of $150 off for any of my wonderful blog readers if you mention this post!) More info here. Thank you friends. I very much hope to see some of you in one of these gorgeous places! Can You Really Have Church in a Yurt? I knew I was preaching in a church on Sunday but I had no idea I would be preaching in a yurt. I did not find out until we were in the far outskirts of Ulaanbaator, Mongolia and the car drove down a deeply rutted dirt path to park near a yurt. Here? I get to be here? This church was just a year old, and composed mostly of nomads who had left the Steppes for the city, in hopes of a better life. Most of the believers were new converts. There was nowhere else I’d rather be. I could tell the story of this day——of these amazing hours worshipping with these brothers and sisters. I could tell all about the singing, the prayer, the message, the laying on of hands and praying for the ill ones, and after, the feast of mutton dumplings, minced salad and milk tea in bowls. Everything about it was heavenly-humble, simple-beautiful. And how they hung on every word—- as if these words from Jude about “Keeping Our Faith” were bread, meat, milk, water and life. Because they are. And they know it. Everyone who could took notes. But I want to tell THEIR stories, and their questions because we need to remember from them. We need their stories and words perhaps more even than they needed mine. Are you ready? This woman had been a a Buddhist her whole life—-75 years. She moved from the steppes here to this place, near the city. She had two goats and needed a place to graze them. But it’s not easy to find grass. She brought them to the yurt church because there was grass in the enclosure no one was using. She brought her goats there every day. One day the people of the church invited her in. She came. She had never heard of this Jesus. And soon she brought her husband. They have known Jesus now for almost a year. Another elderly woman was invited to church by her daughter. She heard about Jesus for the first time. She could not read but she memorized the Lord’s Prayer. She went to visit her son in the hospital, who had liver disease from drinking so much. He lay in bed for 2 years. The doctors could do nothing for him. She came and began to pray the Lord’s Prayer over him, because that’s all she knew. And he began to get better and better. He left his bed. He’s one of the leaders of this church now. He was a bad man before, he told us. He drank all the time, fought, was angry, spoke bad words. I looked at his face, All that was gone, He was now a man of peace who loved Jesus and cared for the people in his church. One more. A woman who spent her life drinking, angry, fighting, desperate. A single mother with no job, then her daughter invites her to church and suddenly she hears a worship song for the first time. She hears about a God who is not far away, a God who is not dispassionate but who loves HER, who has come to be her LIFE. Her frozen heart melts for the first time. She could not stop crying. Now she is in full time ministry. I have heard so many stories here of a saving God, a merciful God, a miraculous God who saved one life after another. And do you know the questions they asked of us this day? One woman has many grown children. They are all Buddhists, as are most Mongolians. “What happens to people after they die if they don’t know Jesus?” she asked, her one good eye fixed on mine. Another woman is afraid that after she dies her children will cremate her body and give her a Buddhist ceremony. “What will happen to me if they do this?” she asked, with worry on her face. Wayne, Caron and I answer the best we can. They take notes of every word we say. After these hours together, we leave, our hearts so full, my eyes overflowing. Remember this? Remember your first faith? Those burning questions? Remember when you went to church because it brought life to you? Remember taking notes? Remember how it felt to truly KNOW you were God’s beloved? Remember when you trusted only in Jesus, nothing else? Remember when you had no hope but In Christ? It’s not too late to recover that faith. Please pray for these sisters and brothers in Mongolia. Their faith is strong, but there is much sickness, poverty and need. I am still in Mongolia, but I have heard the news from the U.S. this week: the shooting, the bombs, the black fruit of hate. I invite you to another place for a few minutes. I want us to remember that there is bigger news going on——-that the kingdom of heaven is breaking out all around us. And even in faraway places where His name is not known. Come with me for a moment to see something beautiful and good? I left Kodiak Friday night, spent the night in Anchorage, then flew out early Saturday morning. The planes were delayed everywhere. We landed in Mongolia in blasting winds Monday, 3 am. after circling for almost an hour, waiting for the winds to lessen. I did not sleep for a second in all those hours. But when I woke up later, I saw this. Three days ago we drove out of the city into the countryside, into the tawny brown hills and mountains that have already seen snow since September. But this day, the snow was gone. We saw herds of animals everywhere. Half the country lives on the steppes, herding animals. In a nation of 3 million people, there are 30 million animals. It’s a hard hard life. 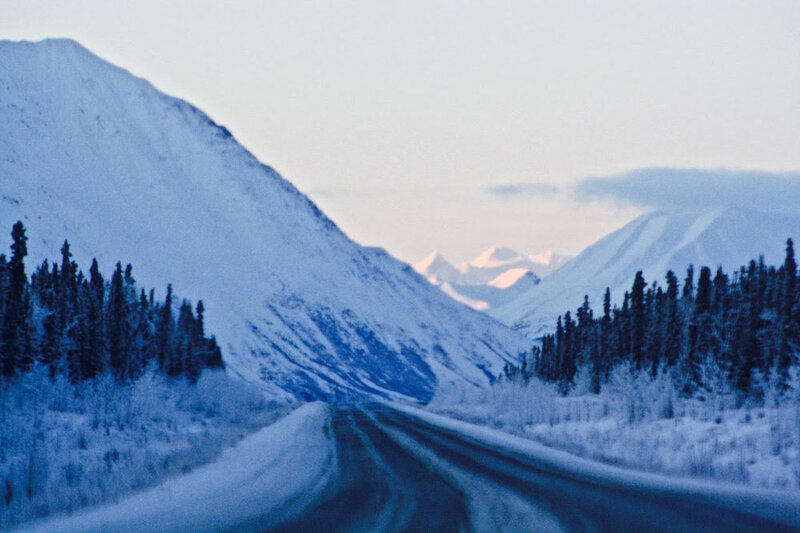 Every year 40,000 move to the city, to escape living in the lap of a bitter wintry mother nature who plunges this land into -40 temperatures. Some years more than half the livestock dies. Many Mongolians still live in gers (yurts), even at 40 below. I cannot imagine this life. I thought of all this as we drove. We drove to Turtle Rock in Terelj National Park, a place called “Little Switzerland” for its alpine views. But for us, who did not come in tourist season, everything was brown, dry dead. Still, I loved the sparse beauty of it. I would love to road trip through ALL of Mongolia, but I did not come to tour. I came to teach, to share what little I know with my brothers and sisters of God here. And that itself is a grand adventure. Yesterday, I went to the School of Ministry with the women of LifeSprings. It was going to be an easy day. I was going to attend Jan Johnson’s all-day seminar, watching the rhythm of it to prepare for my own all-day seminar the next day. But that’s not what happened. Jan’s notes didn’t show up. 100 women were coming through hours of traffic, on trains, in cars and busses from far parts of the country. They had waited 6 months for these classes. And now there was no class. There were no notes. No notes for Jan. No notes for the students. (The why of this doesn’t matter . …it was no one’s fault.). There was only one option: ”Leslie. I hate to even ask this, but can you teach your class today?” I had finished preparing it the night before. I had my computer with me this day, by chance. but I was tired so tired. I had taught a 3 hour parenting seminar the night before. I had jet-lag brain, which is to say, no brain at all. I even brought a pillow to sneak away during the day to rest. How would this be possible? But It was almost time to start. The women were coming in the door. I felt butterflies, I felt dread. I felt unprepared. But It was clear. This was what God was asking of me today. I posted an on-the-fly “HELP!” to my Facebook friends, asking for prayer. (YOU DID!) And at that moment, Duncan was in Alaska on a bush plane and he said he had an overwhelming urge to pray for me. (He DID!) Then the Lifesprings women, my new dear friends, surrounded me, laying hands on me, praying. I cried tears of fatigue. But when the prayer was over, I felt ready. God was going to do this with me, through me today. I was not alone. And He only asked for what I could give. He would do the rest. He blessed far beyond my expectations. Do you know why? Because God LOVES these women! Because God has miraculously saved every one of them from atheism, Buddhism, from hard hard lives, and they NEED God as much as they need breath. (And isn’t God the very breath in our lungs?) These women have NO Christian resources in their language—-except what we were bringing them. And this day was GOD’S design—-not mine. I only had to say Yes. And now, just the day after, I am seeing ALL the reasons God ordered it this way. SO many reasons. Women keep coming up to me and telling what God did—-something entirely new. Something so so deep. I only had to get out of the way of my fear. I only had to remember that God’s plans for these women were far greater than mine. It was a good good hard glorious day. And the fruit will go on and on. Not because of me. Because of Him. I will tell some of these stories next time. I just want you to know that God is on the move here in this country. In incredible ways. I am awake. I am exhausted and I am so wide awake. Because God is among us here in Ulaanbator. And He is with you. The next time God overturns your plans and asks you to do something hard, say Yes. Walk into it. Know the eagle-of-his-strength is with you and over you! And watch what He can do through YOU!! Have you experienced the eagle-of-His-strength recently? I would love to hear! !